The most complete collection of Bible cross-references ever published. Available ONLY from eStudySource and released exclusively in e-Sword format! Let the Bible be its own best commentary, and discover the depth and riches of God’s Word like never before. - Over 900,000 Bible References, meticulously cross-linked from every verse in the Scriptures! - Thousands of specific notes on various Bible topics and Strong's numbers. All are linked and identified throughout. There is no other Bible study resource as complete as this that illuminates every verse in the Bible with insight directly from other passages. It links each verse directly to other Scriptures that shed light on any verse you start from. This tool allows Scripture to interpret Scripture, and lets the Bible explain itself. The Ultimate Cross-Reference Treasury contains more cross references (over 900,000) keyed to more specific words in more verses in the Bible than can be found in any resource, print or digital. This new collection of cross-references enables anyone to study the Bible, and dig as deeply into the Bible as desired. Simply start at any verse, using any Bible translation, to discover what the rest of the Bible has to say about the subjects, topics, concepts, and ideas related to that verse. “I created The Ultimate Cross-Reference Treasury to make it possible for me to share the results of my 24 additional years of intensive Bible study since the publication of my first cross reference work, The New Treasury of Scripture Knowledge, in 1992. These two works alone account for over 50 years of Bible study research collecting and using Bible cross references. Many Bible readers wanted more cross-references in the New Testament made to the Old Testament, and I believe I have more than fully met this expressed desire. "Every Christian needs to deepen his or her relationship with God, with His Son, our Lord Jesus Christ, and with the Holy Spirit, and to continue to grow spiritually. The greatest source of help to grow spiritually is found in the Bible. It is necessary not only to read the Bible, but to study the Bible. Regularly using cross-references for Bible study will enable you to get the most out of the Bible as you let the Bible explain itself. Cross-reference Bible study using this resource will deepen your understanding of the Bible and ground you solidly in your faith. The greatest resource ever produced for cross-reference Bible study is The Ultimate Cross-Reference Treasury.” Jerome H. Smith. NOTE: This module is listed under Commentaries in the e-Sword downloader. The Subject, Topic, and Figures of Speech indexes are contained in the main "UCRT Indexes" in the Dictionary view. The Bibliography, Names, Notes, Prayers and Proverbs indexes are in the Reference Books view. Requires e-Sword Version 11 for the PC. Discover WHY YOU NEED this resource here. Learn HOW TO USE this resource here. 1. More cross-references than ever before - over 900,000! 3. Greatly increased accuracy in the references themselves; former reference errors and printing errors have been carefully corrected. 4. Figures of Speech are included much more completely than ever before, making this the most complete listing of Figures of Speech used in the Bible ever presented. 5. Increased use of emphasis symbols which quickly show which references are clearest, which are the most critically important, and which contain fulfilled prophecy, types of Christ, or are quoted elsewhere in the Bible. And most importantly links for still more information about the subjects in any Bible verse. 6. Major improvements and additions to the indexes have been made. The Indexes alone will provide many years of insight and sound Bible teaching material. 7. 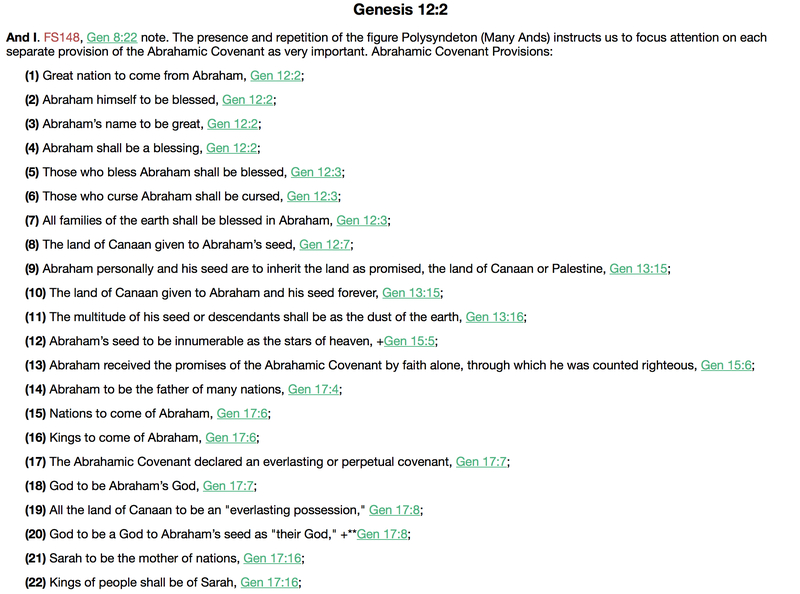 New notes greatly expand on the provisions of the Abrahamic Covenant and the Davidic Covenant, essential to understanding the rest of the Bible. New notes list or explain the names of the Antichrist, the Angel of Jehovah, and the Attributes of God. The many notes in this resource are themselves internally cross-referenced throughout by the designation "note" placed with a cross-reference to alert the user where helpful explanatory material pertinent to the verse being studied can be found. Good solid work. Still learning to use it to its full potential but already a welcome addition to my studies. Especially like the annotated references as a guide to related verses. I have used E-Sword for many years and it truly has been a blessing to my ministry. The Ultimate Cross-Reference Treasury is without a doubt a must-have Bible Study Tool that everyone that is serious about their Bible Study should have. It's a very valuable asset to enhance your understanding of the Bible. I've always been taught to allow scripture to interpret scripture and this cross-reference scripture tool is truly a very valuable treasure to have. The Ultimate Cross-Reference Treasury for e-sword is truly brilliant. the combination of both dictionary and commentary is very good, it gives detail of every verse in the bible with even more scripture references than the other i have used in the commentary. the dictionary is extremely useful more than others i have used. Again, the combination WOW. This was the best purchase ever, thank you e-sword. A great addition to my e-Sword library. You must have it if you want quick and complete searches on a word or subject....super powerful resource! The most comprehensive references in e-Sword! UCRT has become my favorite “Commentary”. Great Study Tool! Thanks for this treasure! I've got a lot of cross-reference guides, including those as a part of a paper Bible (e.g., Thompson Chain Reference) and other electronic forms. This has sheer quantity above all the others, and appears to have the quality of appropriate references equal to or above any of the others too. Very satisfied. Had doubts before my purchase, however, very pleasantly surprised. I am pleased with the UCRt. I have just begun using it to ehance my personal study. I look forward to gaining expertise with the program. Excellent tool. Useful from the very beginning I bought it. It should not replace your own biblical study but enriches it. Thoroughly recommend this resource through e-sword. Have had the printed version for years, used regularly, however now that its available through e-sword am using it every day for my Bible studies. The electronic version makes lookup so much easier and enables moving quickly from reference to reference without yet another book/reference tool opened up in my limited desk space. Don’t hesitate to purchase this particular electronic book, just get it and be glad you did! I use e-sword each day, it is has become part of my daily study of the word. I use all the commentaries and especially like UCRT particularly the verse reference's cuts down search time. The cross reference for words and also gives you a verse. I am slowly getting to know how to better use this great tool, thank you e-sword, without you I would in no way be able to afford such a library of commentaries' and dictionaries. I recommend to people whenever they ask what bible program I use. My wife also is using e-sword, which she quite enjoys. Blessings to you all. the Ultimate Cross Reference Treasury is opening up the gospel for my soul's peace and trust. Excellent what I like most is that it cross references the Tanakh or Old Testament as well as the Brit Hadassah or NT. It’s sort of like a concordance in reverse. Depending on what level of student and study you’re in you might think it’s great. I often compose my own Bible Study lessons, and eSword is my constant companion.It is absolutely delightful to be able to compare several translations,search for words needed, and research Commentaries, all in one place. However, when I needed a cross reference, it was necessary to refer to my paper Bible for those needs. NO MORE! The Ultimate Cross-Reference Treasury more than fills that need, with selections beyond my ability to think of needing. I can’t imagine life without eSword and am very grateful to those who make it available at no charge, and a request for a freewill gift. This is very different from "TSK Cross Reference" in "UCRT Cross Reference" you will find more elaborated Ref. spread across the OT & NT. Scripture interprets Scripture. Appreciate the light and insight from Scripture relating to Scripture so quickly available with this resource. I am finding this to be a very useful tool in gaining a deeper understanding of Scripture. It also cuts down on the time that I need to spend in searching for related passages. I was really excited to see that this was available for my iPhone. After installing it I discovered a whole new dimension added to my studies. Thank you so much for this important and invaluable tool. I've used the UCRT for a couple of weeks now and really appreciate it. It has deepened my Bible study. Excellent resource for Bible students. I found the cross reference very good but the commentary not very good,seems to be based on conventional belief rather than diligently studying the Bible. Very helpful cross-reference. I am glad I bought that. I have been studying the word lately and this is helping me do it. I am a serious bible student. My goal is to know God (as much as is possible) so that I can make Him known to others. I realize not everyone can relate to God and how much He loves us - so I have made it my goal to portray God in the light of the Gospel. Treating the Bible as a connected book of stories, poetry, prophetic writings, and instruction for right living, I believe the "Ultimate Cross-Reference Treasury" is a "must have" tool to present a clearer picture of how much God loves us. I have enjoyed the ease and speed with which the cross-references are employed and have found it and invaluable tool when doing topical studies. The expository components are very helpful. I have used e-Sword for Bible Study (and still do), research, and just relaxation. One of the major features I really like is the verse/commentary linking. Read a verse and read the entries in the commentaries without stress! Well, adding the UCRT to the mix is a powerful addition. No matter the version of the Bible or where I happen to be reading, all commentaries, dictionaries, and supplimental books are linked so finding insights of the Ancient Authors is simple. I try to use the CCEL, but it's difficult because you start on the first word and work your way through. Good, yes, but time consuming. This is MUCH better! This is a great resource. It has helped me a lot with my Bible study and texts exposition. I am pleased with my purchase of UCRT. I use it extensively for my exegetical study. I teach a Bible study at my church. We study all the books of the Bible. Many of the questions people have about a certain verse can be answered by checking other verses that address that subject. Often, verses from the Old Testament clarify verses from the New Testament, and vice-versa. It is clear that the Bible has, ultimately, One Author! The Ultimate Cross-Reference Treasury is a big help when looking for those other verses. It has more listings than any other Bible reference I have. I use it a lot when preparing my lessons. I'd recommend this book for anyone who wants to know more about the Bible. We always say "let scripture interpret scripture" and this is the very tool that does that. I have found myself using commentaries less frequently since purchasing this. It integrates in E-Sword flawlessly and there is no learning curve for usage. Cannot recommend this product enough as it will greatly improve your personal study time. This is a great, great add on. Worth every cent. Far richer than TSK Cross References, which I have used for years and have often grieved how much was missing. UCRT Cross References highlights more words and makes richer connections across the Scriptures. Highly recommended. I've been using the Cross-Reference Treasury for a few weeks in studying various themes as well as working on an extensive teaching. It's easy to use and very useful for it's intended purpose -- researching related scriptures. It is simply an invaluable resource. I really love the chain references in the original NASB. This Ultimate Cross Reference Treasury gives me an excellent topical reference opportunity. This is a "Must Have" add-on reference book for any serious student of the Bible. It was well worth the price!! Very complete and a terrific time saver. By far the most thorough cross reference system I've seen. I couldn't be happier with this product. The scriptures come alive as the Bible becomes it's own commentary. Have only used for a short while but am already greatly impressed with this reference. Looking forward to digging deeper into my study and lesson preparation. Recommend this to all who wish to develop a deeper understanding of the relationships between the different books and verses within the bible. I've only had this a listenable but have been impressed with it. The TSK has only cross references which invoke but.this has cross references and other information as well. I have used TSK for quite a while. This cross reference is even better! Excellent tool for looking at all the scriptures that relate to a subject being studied. The Word of God explains and reveals itself so it is often more useful to do a study using this than just using a commentary. It is interesting to see what commentators say, but always good to look directly into the Word and let the Holy Spirit quicken it. A very useful tool and highly recommended. This commentary further reinforces my belief that the greatest commentary of the Bible is the Bible itself. This resource have given me information and references to other verses in the bible that gives profound insight on the verse that I am reading. Surely, the Ultimate Cross-Reference Treasury have lived up to its name as the ultimate cross-reference. I highly recommend this to all users. If you have been using the TSK for so long, this resource will complement, if not, replace TSK as your main driver in cross-referencing for you bible. I'm glad and blessed I've decided to purchase UCRT. I have for some time totally appreciated and enjoyed the beloved classic, the treasury of scripture knowledge! It is a fabulous resource and I use it everyday. In fact, it is my main source Of Bible study. I ordered the ultimate cross reference treasury thinking the original tsk probable could not be improved upon, was I wrong! This new work is extensive and put together nicely. I just plain enjoy it to my hearts content. It is everything the original is (and original is just awesome)and more. I like that it has explanatory notes and a commentary too. This work, along with the search function in e sword and the compare translations feature, make for a bible study time that can't be improved upon. There is nothing so illuminating and enlightening as comparing scripture with scripture, and this tool makes it possible to find and dig out many nuggets from Gods word and feed upon them. I would very much recommend this resource to anybody who is looking for an effective and fun way to study the bible. This is a fantastic resource for in depth study. You can let the bible interpret itself instead of relying on what commentators think it says. A great addition to e-Sword! I have had this resource for about 3 weeks now and have found if very useful in preparing my Sunday school lessons. Excellent cross reference for digging deep into God's Word. Wonderful resource, with more cross references and Greek and Hebrew word definitions as well as commentaries. It has been a great help so far. I so love e-Sword and the Ultimate Cross-Reference Treasury works with it in the most awesome way. I can move my mouse over the references and immediately see what it says instead of having to leave the page I am on. 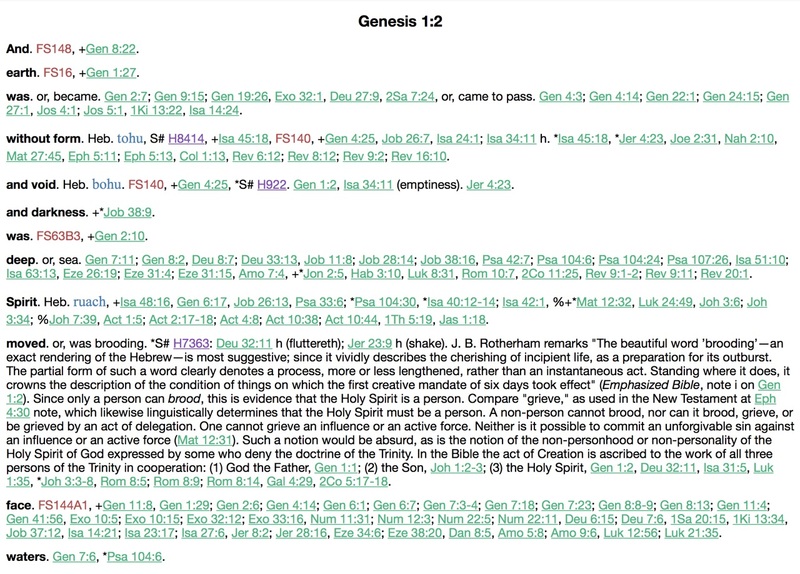 It makes for quick viewing and choosing what I want to use when studying the Bible. What an awesome twosome: E-Sword and the Ultimate Treasury. Thanks for both programs. I am sure all will be blessed who use these on a regular basis. Through the many years of my e-Sword use, the TSK was my constant friend for locating parallel and related passages. On just my first use of The Ultimate Cross-Reference Treasury I was blown away at the amazing increase of depth and breadth of related passages listed, as contrasted with the TSK. Every e-Sword user who invests in this superb resource will immediately agree that the upgrade significantly surpasses all expectations! I use the scripture as my biggest source to study the Bible. The Ultimate Cross-Reference Treasure (UCRT) combined with the Treasure Scriptural Knowedge (TSK) which also comes from e-Sword. What one does not cover the other does. UCRT has the astrik showing the verse that is closest to the one that is being referenced. Also uses the "note" notation to bring up additional information. Downloading UCRT took a little time. I mean the download went fine it just took a little time for it to show up on my downloader. That could have been my computer problem. I really glad I purchased the UCRT. It is worth it's weight in gold. In fact e- Sword software is worth it's weight in gold. I have just begun to use this resource, but I am impressed. I am a traveling Professor who teaches at Bible Colleges and Seminaries around the world, and I recently found some very useful information on the last verses of Mark's Gospel. The notes were the best I have seen on the subject. I highly recommend this resource. This will help me research topics and reinforce any point I am trying to make in my college class at Grand Canyon University Theology program. I am four classes from gettin my Bachelor's. I found this study aid to be well organized and about double the resource of the Treasury of Scripture Knowledge (TSK) content. I use it every day. this is a real time saver as well a great resource. This has been a very good resource for me, what with being a Bible teacher and Bible Translator. This is by far one of my favorite resources that I have and use on my e-sword! You not only get scripture references, but you get words that are tied into Strong's definitions and even some explanatory notes on difficult passages. It takes the great, ageless reference of TSK to another level! The Ultimate Cross-reference Treasury is an excellent resource, very helpful for the study and preparation I do for Sunday sermons and Bible teaching. It helps identify connections in Scripture that I hadn't thought of or been aware of, enriching the content of my research. Especially helpful as it is integrated with the wider Esword resource. Learning how best to use this Help and realizing how complete it is. Still getting used to moving around and using the data in teaching Gods Word. I have Naves, and it has served me well over the years, but this is like adding Nitro to the tank. It gives a much more accurate match to particular words and phrases. A must have for someone like myself who wants to "compare Scripture with Scripture" as this program is like living in the mind of a puritan! Brilliant work! Excellent references and material. Most helpful in study and sermon preparation. Another valuable tool from e-Sword! I had not used a cross reference tool before and before I bought this tool from e-sword I went online to see how these types of tools are used. Wow was I impressed AND after I bought this cross reference tool from e-sword I was absolutely blown away with how much I can do with this tool. I love e-sword as I can absolutely lose most of a day in word study's and NOW I CAN spend hours and hours detailing Gods words and how the scripture defines scripture. Buy this you will not be disappointed. I've only downloaded this recently, but in checking it out, I am convinced this will be a very valuable resource for Bible study. I used the examples given to do a 3 level study, and this works quite well. Thank you for this tool! The Ultimate Cross-Reference Treasury has saved much time when I want to check other verses for phrases in a verse rather than looking at the Greek or Hebrew definitions as I like to check other scriptures where they use the same phrase. This is the most outstanding resource I have ever used to compare scripture with scripture. Treasury of Scriptural Knowledge has been a long favorite reference of mine for years. I purchased the New Treasury of Scriptural Knowledge as well. At one point I bought a case of TSK for my Sunday School class, telling them to take one only if they intend to use it. The Ultimate Cross-Reference Treasury continues in this same tradition and having it on E-Sword is a great convenience and help. I am impressed with this reference and recommend it to all. As it's predicessors, it allows you to use the Bible as a commentary on itself. Highly recommended. For me the two most valuable resources when reading the Bible are a concordance and cross references. The Treasury of Scipture Knowledge is an excellent resource to assit and teach cross referring and this Ultimate Cross Reference Treaurer is simply a welcome extension of that. In the end a person must familiarise themselves and build up their own knowledge but this resource is a valuable assist and extremely useful in furthering that. It is God Who gives understanding and ...not in the words which man's wisdom teacheth, but which the Holy Ghost teacheth; comparing spiritual things with spiritual. This resource is therefore to be recommended.